We are looking for an energetic and weather proof personality open and involved in contact with children. 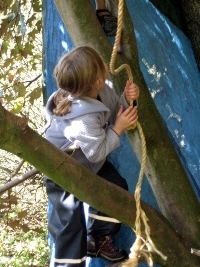 You will gain a deep insight into outdoor pedagogic executed by a team of for experienced teachers. The familiar atmosphere in our outdoor after school club (OASC) is driven by its special neighborhood – nature. The noise threshold is far lower than in conventional closed locations. The silence you will experience here nowadays is a rarity and it greatly satisfies not only the kids but adults as well. Values like appreciation and respect are fundamental for us – particularly towards the children. In addition we emphasize an atmosphere of emotional security as best conditions for our kids’ development where parents and team members feel good. We foreground social learning, the experience in a group and the individual development of each child. We offer an attractive position within an sympathetic team giving distinction to the facility by your very own ideas. You will find creative leeway and convenient conditions like a weekly team-meeting, professional talks, individual time and supervision. You like to join and enforce our team? You feel appealed to the job in our OASC, you love school children and nature as well and like to work with colleagues and parents as partners? Any questions in advance? Don’t hesitate to call Karen (she is a member of the board and head of the team. She’s been to the US for a couple about 6 years, so conversation can be held in English as well) +49 160 702 54 74.